Sail to St. Michaels. Call now and reserve your getaway!!! 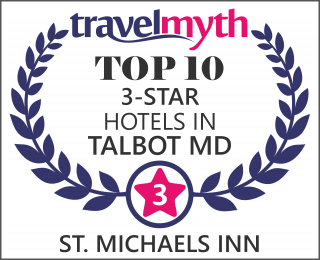 We welcome you to the St Michaels Inn, we are an independently family owned Inn offering quality accommodations at affordable prices in the Town of St Michaels, Maryland. The Inn offers guests a comfortable, quaint experience unlike any other in the area. We pride ourselves on our family-friendly accommodations and offer 92 well-appointed spacious, comfortable rooms. The guest rooms have all been recently updated and each room is equipped with flat screen TVs, refrigerators, microwaves. Breakfast is included in your stay and an outdoor pool is open during the summer season. The historic town of St. Michaels is located just 1 mile from our campus and we offer shuttle service to and from town for our guest. Begin relaxing today with our easy online reservations. Call us to check our rates and availability. Whether you are booking a Yoga Retreat or a Corporate training at St Michaels Inn we have flexible space to meet all of your needs. Our property features flexible space for your next event. In addition to the traditional event elements we are happy to meet the specific needs of our guests. Here at St. Michael's Inn we are constantly working to offer more of what you and your group want. Book your event Today.